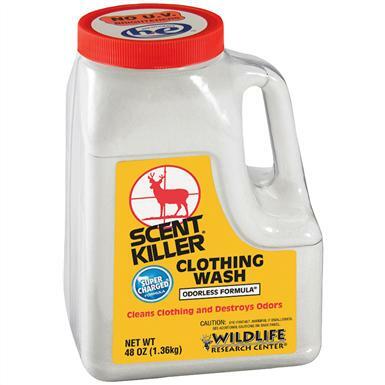 Scent Killer® Clothes Wash Powder, 48-oz. Keeps scent away all day long. When you've got a "date" with your deer, prepare with Scent Killer® Scent-control Formulas. Formulated to attack and totally neutralize odor molecules, Scent Killer products keep scents away all day long, so the deer's nose doesn't know! The body products (Soap, Shampoo, Deodorant) are odorless and gentle on skin, but hard on human scent! Made in Canada. Scent Killer Clothes Wash Powder, 48-oz. is rated 4.8 out of 5 by 11. Rated 5 out of 5 by Miltman from Does what it says!!! To test this product I was washed an old comforter that have on my desk that's used by my dog when she's outside. Needless to say the comforter can get smelly. After the wash I couldn't detect any odor at all. Not only will I use this on my hunting gear but my smelly gym clothes as well. Rated 5 out of 5 by JAMES from We've used it in the past and have been very pleased. I like the fact that since it's a powder it will have no adverse affect on our rain gear. Rated 5 out of 5 by JEFF from gets your clothes clean and scent free. Rated 5 out of 5 by NICHOLAS from Great product. Same stuff they sell in the store, but at a better price. Rated 4 out of 5 by GILBERT from It works. Clothes come out clean. Rated 4 out of 5 by RANDY J from Great product at a good price.